Little Aire Falls after some rain. 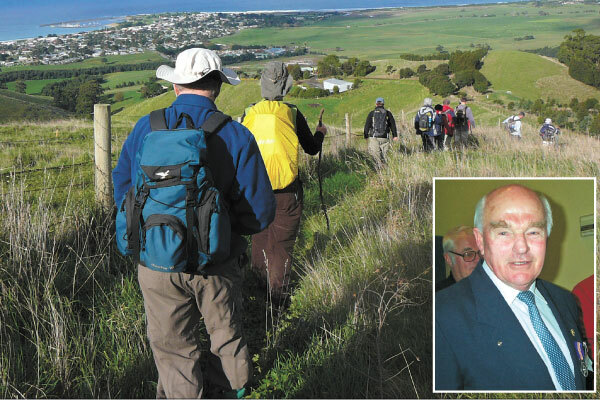 Walkers were from GBC and the Otway Ranges Walking Track Association. The walk commenced at the carpark for Triplet and Little Aire Falls, which are some 15 km south of Ferguson, about 5 km west of Beech Forest. We admired the swollen Triplet Falls from 3 separate viewing platforms, and then walked a rather circuitous route leading to Little Aire Falls, where "Little" refers to the river, not the spectacular Falls. On the return, we made a major detour (2 and a half hours return) along overgrown Phillips Track to the Aire river. 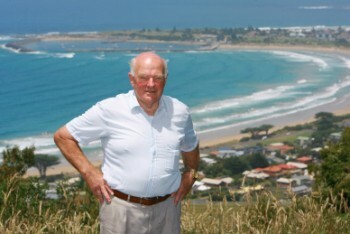 Brian McKenzie recalled riding a bike along the (then) good track many years ago. Our route was generally obvious along the track, benched on one side and dropping away on the other. Before descending to the noisy, attractive, full Aire River, the track turned sharply left (east). After some 200m we saw minor relics of the bridge and hut. The forest contained very tall old growth, and smaller regrowth, mountain ash, plus beech trees and tree ferns. A very attractive walk in good company.